This may look like a light-hearted piece of string art, but it’s actually part of a very serious effort to understand what happens to the brain when it’s strung out on drugs. The image, one of the winners of the Federation of American Societies for Experimental Biology’s 2013 BioArt competition, was created with an advanced form of magnetic resonance imaging called Diffusion Tensor Imaging (DTI). DTI works by detecting the movement of water in the nerve cells of a living brain. By determining which direction water is flowing in axons, the long processes that convey signals to other neurons, researchers can figure out whether the neurons are stretching from the left to right side of the brain (red), top to bottom (blue), or front to back (green). 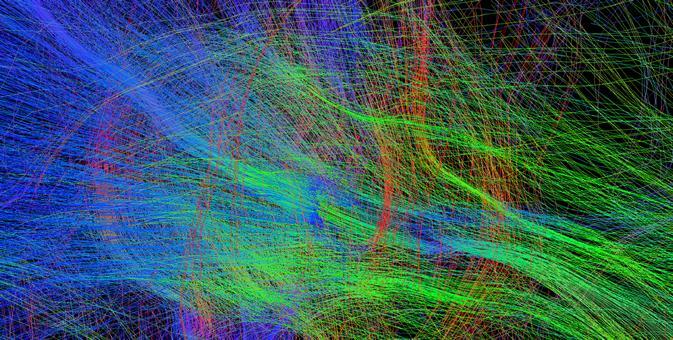 This data is then used to construct a three-dimensional view of the brain and its connections. In this particular image, we see the brain of a monkey before the animal was exposed to cocaine. The NIH-funded team is using DTI to study the changes that occur after short- and long-term cocaine use, and also after a period of recovery. It is well known that cocaine users behave erratically, are sometimes violent, and show poor decision making. But the biology behind such behaviors isn’t well understood. Do the behaviors arise because neurons die and connections are lost? Does the brain rewire itself with long-term cocaine use? Or does cocaine damage the structure of the neurons and cause them to leak water and function abnormally? The researchers hope to find answers to these and other questions as they examine these exquisitely informative DTI images. Why don’t you use actual addicts for these tests rather than innocent monkeys? You could then give the addicts vouchers of some sort. But why is it important to know the answer you’re looking for? Great Work DTI. Highly Appreciable!! Thanks for Sharing. I like what you guys are up too. Such smart work and reporting! Carry on the excellent works guys Ive incorporated you guys to my blogroll. I think it’ll improve the value of my website.